Brentford earned their first home win of the season as they came out on top after an exciting game with Brighton. Moses Odubajo angled in a drive and Andre Gray steered home Jake Bidwell's left-wing cross to put the Bees 2-0 up. Brighton pulled one back through Gordon Greer's volley but fell two goals behind again when Jonathan Douglas powered in another Bidwell cross. Danny Holla's 25-yard shot gave the visitors hope but Brentford managed to hold on for the three points. 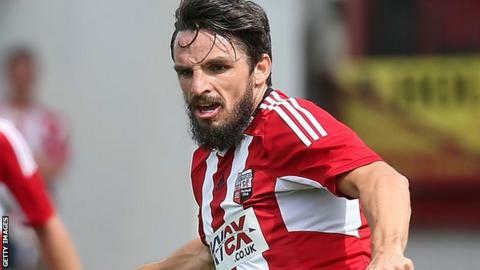 The victory gave Brentford their third league win in four games as they moved into sixth place in the Championship. Brighton suffered their first league defeat in four games but started the game stronger. The Seagulls almost capitalised on a Brentford defensive blunder when Andrew Crofts fired a sizzling drive against the post with just three minutes gone. Brentford then saw Gray hauled down by Lewis Dunk, but the big defender escaped with just a yellow card despite being the last man. Brighton striker Sam Baldock should have put his side ahead on 18 minutes, but rounded keeper David Button only to see his weak effort cleared off the line by James Tarkowski. However, once Odubajo scored, Brentford seized the initiative and came out on top of the end-to-end match. "Three points was very important. This was a big game against a club who were in the play offs last season with good, strong technical players. "From 15 to 40 minutes we were as good as we have been this season. "I'd have preferred us to start faster - we talk about that a lot - but perhaps we couldn't because they were very good. The fact is we weathered it and scored on the break before playing some fantastic football." "It's no consolation that it was an entertaining game because we didn't get anything from it. "In the first half we were not convincing defensively and we made it too easy for Brentford to get behind us and score. "When we have the ball we can play football and concentrate on what we do well, but the key is to score goals and on too many occasions were off target going forward and not tight enough at the back." Match ends, Brentford 3, Brighton and Hove Albion 2. Second Half ends, Brentford 3, Brighton and Hove Albion 2. Attempt missed. David Stockdale (Brighton and Hove Albion) right footed shot from outside the box is too high following a corner. Corner, Brighton and Hove Albion. Conceded by Nick Proschwitz. Danny Holla (Brighton and Hove Albion) wins a free kick in the attacking half. Corner, Brentford. Conceded by Íñigo Calderón. Attempt missed. Íñigo Calderón (Brighton and Hove Albion) right footed shot from outside the box is too high following a set piece situation. Attempt missed. Stuart Dallas (Brentford) left footed shot from the right side of the box is high and wide to the left. Assisted by Moses Odubajo. Attempt missed. Danny Holla (Brighton and Hove Albion) right footed shot from outside the box misses to the left. Assisted by Andrew Crofts. Substitution, Brentford. Jon-Miquel Toral replaces Alex Pritchard. Attempt missed. Joe Bennett (Brighton and Hove Albion) header from the centre of the box misses to the left. Assisted by Danny Holla. Attempt missed. Gary Gardner (Brighton and Hove Albion) right footed shot from more than 35 yards is too high. Assisted by Kazenga Lua Lua. Attempt missed. Joe Bennett (Brighton and Hove Albion) left footed shot from the left side of the box is close, but misses to the right. Assisted by João Teixeira with a through ball. Offside, Brighton and Hove Albion. Gordon Greer tries a through ball, but Sam Baldock is caught offside. Corner, Brentford. Conceded by Aaron Hughes. Attempt saved. Alex Pritchard (Brentford) right footed shot from outside the box is saved in the bottom right corner. Assisted by Moses Odubajo. Substitution, Brighton and Hove Albion. Kazenga Lua Lua replaces Adrián Colunga. Substitution, Brentford. Stuart Dallas replaces Jota. Goal! Brentford 3, Brighton and Hove Albion 2. Danny Holla (Brighton and Hove Albion) right footed shot from outside the box to the top right corner. Assisted by João Teixeira. Attempt missed. Alex Pritchard (Brentford) right footed shot from outside the box misses to the right. Assisted by Jota. Attempt missed. Alan Judge (Brentford) left footed shot from the right side of the box is high and wide to the left. Attempt blocked. Moses Odubajo (Brentford) right footed shot from the right side of the box is blocked. Assisted by Alan Judge. Goal! Brentford 3, Brighton and Hove Albion 1. Jonathan Douglas (Brentford) header from the centre of the box to the bottom left corner. Assisted by Jake Bidwell with a cross.